ABC Marquees provided both the ceremony and the reception marquee for a beautiful Spring wedding in Vines Cross, East Sussex. Having decided to celebrate their marriage at the family farm in May 2015, Alexandra and Neil wanted a simple open-sided marquee for their wedding vows and a glamorous fully furnished marquee for their reception. 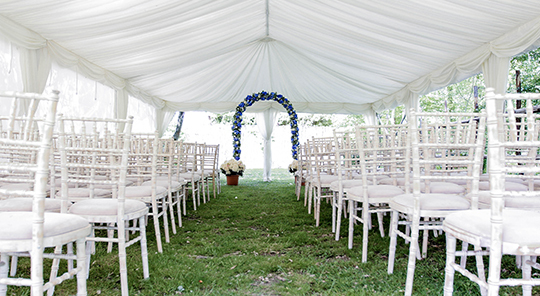 Keeping an ivory theme throughout, we provided a 6m x 12m marquee complete with linings for the ceremony; with simple Lime Wash chairs, open sides and grass under-foot, the marquee had an air of Bohemian chic. A simple arch of blue and white flowers framed Alexandra and Neil as they recited their wedding vows. The 9m x 12m reception marquee maintained the ivory theme with matching wall and roof linings, swags, and a Champagne coloured carpet – a minimalist glamour that was beautifully balanced by two black chandeliers. Nine round tables with the couples’ own table decorations and the same Lime Wash ivory chairs created an intimate but uncrowded seating plan, with plenty of space remaining for the 12′ x 14′ dance floor.